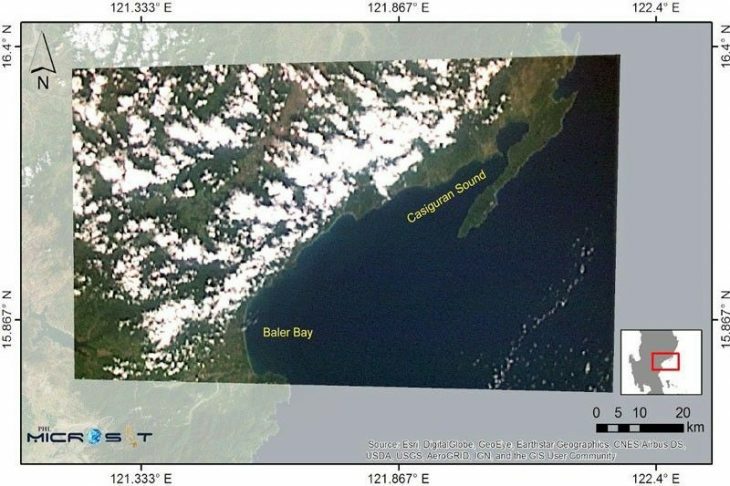 The first images captured by Diwata-2, one of which shows the coast of Baler, were released yesterday by the PHL-Microsat program. MANILA, Philippines — A gray-scale image of the Earth was among the first photos captured by Diwata-2, the second Filipino-made microsatellite launched into space. The Philippine Scientific Earth Observation Microsatellite (PHL-Microsat) program on Sunday released the first images captured by the satellite, which also included snapshots of the fields of Kalinga and a portion of Aurora. The image of the Earth was taken using the satellite’s wide field camera and shows large cloud patterns above the South China Sea. The Kalinga image was taken by Diwata-2’s high precision telescope, while the Aurora image was captured using the space-borne multispectral imager. The PHL-Microsat said Diwata-2 can capture several images within a cropping season, making it useful for determining the stages of crops and estimating potential yield as well as assessing the damage brought by flooding, drought and other disasters. “Images of coasts captured through Diwata-2’s cameras can be used to assess coastal conditions which are key indicators for water quality, ecological health and resource management,” it added. Diwata-2, built by Filipino space engineers in Japan, was launched from the Tanegashima Space Center on Oct. 29. It is the second iteration of Diwata-1, which was launched in 2016. Both Diwata 1 and 2 are Earth-observing microsatellites capable of capturing images of the planet for environmental assessment. Another Filipino-built satellite – a smaller “nano” cube satellite called Maya-1 – was launched into space earlier this year. PHL-Microsat said Diwata-2 will orbit at a higher altitude than the previous microsatellite, enabling it to have fixed revisit intervals that would make repeated environmental monitoring of specific areas possible. Like Diwata-1, it also has a wide field camera, a middle field camera, high precision telescope and space-borne multispectral imager (SMI) that have notable improvements in performance. “The major features that distinguish Diwata-2 from its predecessor include deployable solar panels for increased power generation output and an enhanced resolution camera which increases the resolution of images taken by SMI,” said the program. “Furthermore, it will feature two locally made experimental modules: an amateur radio unit for emergency communications and a satellite orientation module for increased pointing accuracy and future satellite development initiatives,” it added. The microsatellite was funded by the Department of Science and Technology (DOST) through the Philippine Council for Industry and Emerging Technology Research and Development. It was built through a collaboration between University of the Philippines-Diliman, DOST-Advanced Science and Technology Institute, Hokkaido University and Tohoku University in Japan.